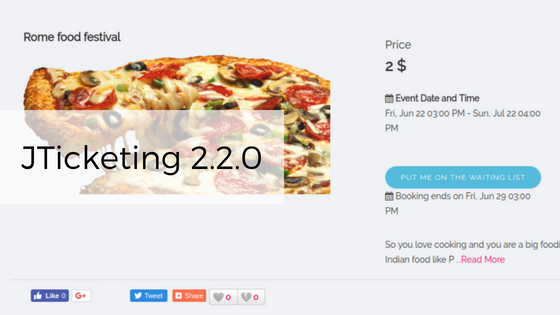 We are super excited to release JTicketing 2.2.0 which brings the ‘Event Waiting list’ feature. This brings a lot of value to those of you building event marketplaces, simple event sites or even those using JTicketing to manage their organization trainings. While our original JTicketing v2.2. roadmap talked about a lot more features, we decided to get v2.2 out with the major feature that was in the original plan - Waiting lists. The rest shall be released very soon in a version update. This was done to do the release quicker since some of the other features were taking more time than expected. We will do a new roadmap for v.2.3 soon with complete details of what to expect. Besides the feature, we have resolved quite a few bugs and made some overall improvements in this release. Read the release notes before upgrading to the latest version as there are some backward compatibility breaks in this release. To know more about this release and complete details on how the Waiting list system works, read on! When you have events that are popular you tend to sell out pretty fast typically leaving lots of people disappointed that they could not get seats. Having a waiting list in such a situation helps in multiple ways. For one, it lets people register their interest and also gives you a quick idea as to how many more people want to attend. On the basis of this information, you could either expand the venue to fit more people or plan additional events to serve the demand. Without a waiting list, you have no data to take these important decisions. JTicketing 2.2’s Waiting list functionality brings you this and much more. Once you enable the Waiting list feature, Participants will see a ‘Put me on the Waiting List’ button for events that are sold out. As an admin, you can choose to enable this feature for E-commerce Events, Classroom ones or both. In case of Classroom trainings, we support an optional ‘Auto Advance’ feature which will advance people from the waiting list in case of cancellations. This is not available for E-commerce events since it involves a lot of complications with payments and refunds. However, in both cases, you can choose to notify people in the waiting list asking them to book when cancellations happen or event capacity increases. Admins Event Owners have the ability to track waiting list users, manage their status and also email them. Please refer to the documentation for details on how to configure and use this feature. If you are using JTicketing with EasySocial events, our earlier releases had an issue where the Attendee count was not updated when events were purchased in JTicketing. This has been resolved in this release.